I love Spain with its heat and contrasts, the intensity of its history and music, and particularly its Moorish architecture. Nowhere is this more impressive than in the gardens of the Alhambra. On my visit there in 2001 I was overwhelmed and just wandered about in a daze. 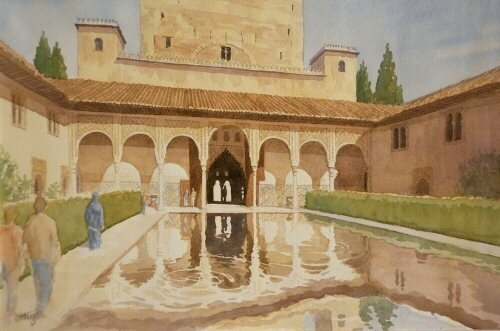 But since then I have worked up paintings from sketches and memories, and the Court of the Myrtles with its reflections in the water has a peacefulness that is quite special. I enjoyed being back there in my mind when painting.